Fast forward to this year and I had not run another race of that distance since 2014, let alone any run at all of that distance. 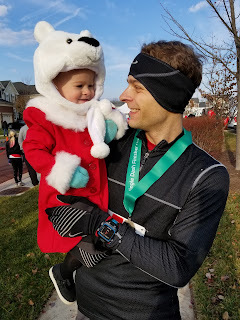 With my daughter being born in January and the fact that I was still recovering from a knee injury, my training was inconsistent, but put it nicely. I wasn't sure what I'd be able to realistically run the race. 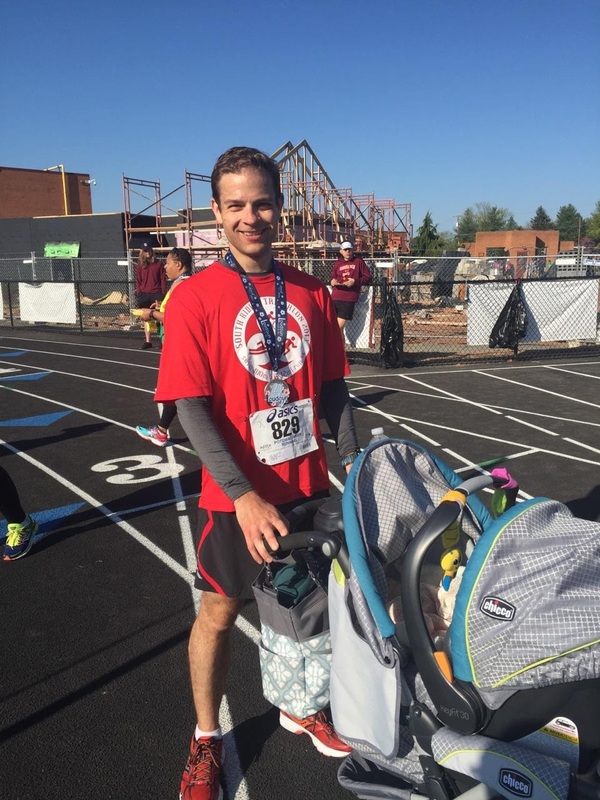 I told my wife that my goal was 1:42, but that was based on poor math. I was actually shooting for a 7:30 min/mi pace, which would be about 1:38. The race started at 7am at a local high school. Actually, one of the high schools benefiting from the race, which meant lots of high school volunteers, and thus lots of high-functioning water stops. It was about 45F at race start and because it was dark when I was leaving my house, I forgot both sunglasses and a running hat. The half marathon had about 650 participants, so this was not exactly a big race and it was pretty easy to work my way through the initial crowd after the starting horn. I like playing game of picking who I think is going out way to hard. I picked one guy, based on the fact that his neck was bright red and I could literally see him sweating within the first mile, but he proved me wrong, as we passed each other four or five times over the course of the 13 miles. I'm not sure who passed who last. The elevation profile of the race was interesting. The first couple of miles were on the incline, but then there was a three-mile segment of steady downhill. This thoroughly messed with my desire to pace myself out to 7:30, but I had my heart rate monitor on and ran as fast as I could staying within my aerobic zone (i.e., below 159bpm). 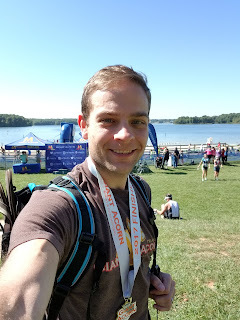 I'd need the time savings I made in that section of the race because after some rather steep inclines and declines for the next four miles, the race finished with the last three miles being all uphill - about 80 feet of elevation gain. At the ten-mile mark, I threw my heart rate restriction out the window and pushed my pace, which was frustrating because I didn't really speed up - I just didn't slow down (thanks, hills). The race ended on the high school track. Coming around the last bend I found my wife with my daughter (who was sound asleep in the stroller) and pushed myself that much more for the final bit. I ended up with a chip time of 1:38:05 which is sub 7:30 min/mi, so I felt great about the race. I'm really looking to get back into a structured running regime and improve that pace even further. My next goal is going to be to break 7 min/mi. But before I do that, I have a few triathlons to do. Eventually, I'd like to do a 70.3 triathlon, though it's hard to imagine doing this race after having swam and biked.